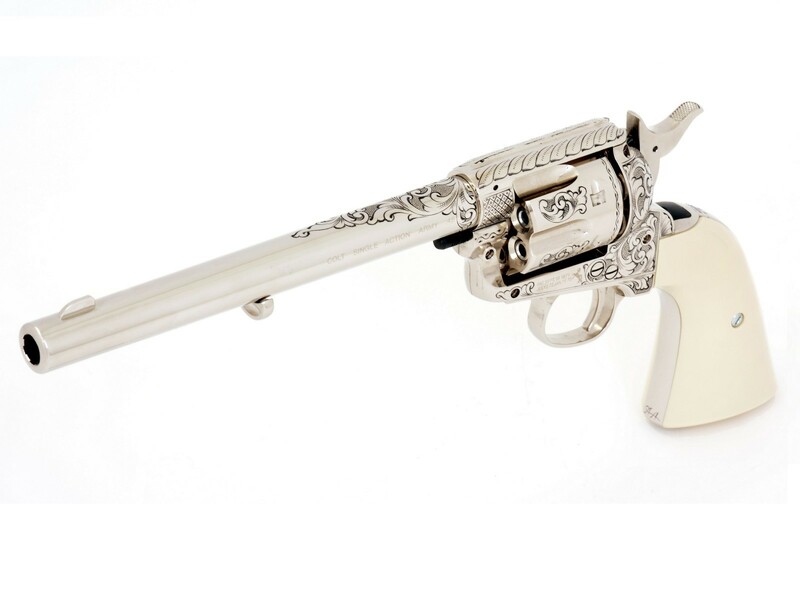 The designs on this gun are copied from an original L. D. Nimschke Colt Peacemaker done for New York City retailer Schuyler, Hartley & Graham in the 1870s. 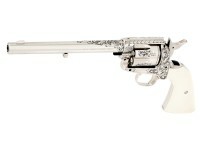 It is reproduced here by John J. Adams, Jr. for the new 4.5mm nickel plated 7-1/2 inch Peacemaker pellet model. 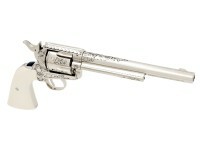 The revolver comes with white (faux ivory) Micarta grips and has the same L.D. Nimschke engraving patterns as the 5-1/2 inch model, only in an all-nickel finish, with the hand engraving inked in by hand for added detail. Things I liked: Everything, almost! I purchased one pellet and two of the bbs', and all three are very, very nice. All three came exactly as described, short on nothing. The engraving is deep and beautiful and covers much of the two bbs' but not quite as much on the pellet due to the longer barrel. I am very happy with them. These however, I haven't shot and don't plan to, so I don't know about the accuracy but I would guess it's as good as the standard models. One more thing, even though I ordered the two bb versions on different dates PA, was able to send them with consecutive numbers, and you can't beat that! Things I would have changed: This is why I wrote almost above. A nicer box or certificate of authenticity would have been nice to display with these Colt SAA's but for the price I paid and for all the Adams and Adams engraving that these have on them it was a Great deal. What others should know: If you look around you can buy some nice display cases at most gun shows and at very good prices. Buy yourself one of these and then look around for a copy of "Guns of the Old West" magazine, they had a great story about these special editions pistols and Adams & Adams, together you have the 'things I would have changed' covered. Things I liked: A really nice revolver, that is a work of art. Waited a few months but worth it. 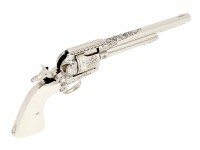 The crocuses were minor, and at the end of the day it is an excellent revolver exhibiting outstanding value. 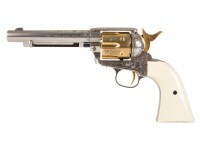 As stated an excellent revolver that had the potential to be exquisite. Still deserves 5 stars. Pyramid sent me the grips. I would still order one , just think there has to be a little more effort. Compared to what an actual engraved Colt Single Action costs it is still a bargain. All that stuff is wrong, missing or screwed up on a special edition co2 revolver you payed almost $600 for and you still gave it 5 stars all around??? WOW, just wow. I would have returned it if anything short of perfect. I totally agree with Tony in that I would LOVE to buy a quality nickel plated lever action rifle with the same hand tooling you have on these pistols, to add to the collection. I noticed you can get this in bb or pellet. So are there going to be 100 of each or 50 of each? And do you have any nice wooden boxes that say COLT instead of John Wayne? Is one of these choices in a 5.5" or are they both 7.5"? The ads are a bit confusing. 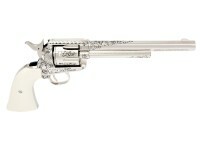 I'm considering ordering this gorgeous revolver. It's good to see you do limited editions. Now would you PLEASE consider offering a quality nickel plated, wood stocked, CO2 Lever Action rifle or carbine? PLEASE?!! I would be the first to order and I believe it would sell if it is a quality piece. Thanks. Does this $549.00 air pistol come with a nice wooden presentation case or a plain cardboard box like the $119.00 version?